If you're someone who gets easily choked up about animal cruelty, you might want to prepare yourself. We still haven't stopped tearing up after watching last night's CNN documentary Blackfish. The revealing film investigated the death of Sea World trainer Dawn Brancheau in 2010, and the effect that captivity has on killer whales and other animals. It was shocking, eye-opening, and made us rethink ever attending an animal park again. The film's director, Gabriela Cowperthwaite, used to regularly take her family to Sea World's San Diego location to ooh and ahh at the remarkable fish in all their glory — until Brancheau's death, that is. The trainer was pulled underwater by a 12,000-pound Orca. The tragedy led Cowperthwaite to look into her questions about the safety and humane conditions of the animals and eventually inspired her to create the documentary. What she found was deeply disturbing insight into the lives of animals in captivity. She interviews several former and current Sea World employees, who surprisingly said they would never bring their own families to an animal park. One of Blackfish's most disturbing interviews comes from John Crowe, a former diver, who details the kidnapping process — and yes, kidnapping is the only word to describe what happens to these animals. During one operation in the '70s, scientists were attempting to capture a baby orca from its family, who refused to leave the nets and allow their kin to be taken away. When all was said and done, three of the whales had died, so the scientists cut them open, filled their carcasses with rocks, and sunk them to the bottom of the ocean. Crowe could barely get through the tale without tearing up. As expected, Sea World is anything but happy about this documentary. 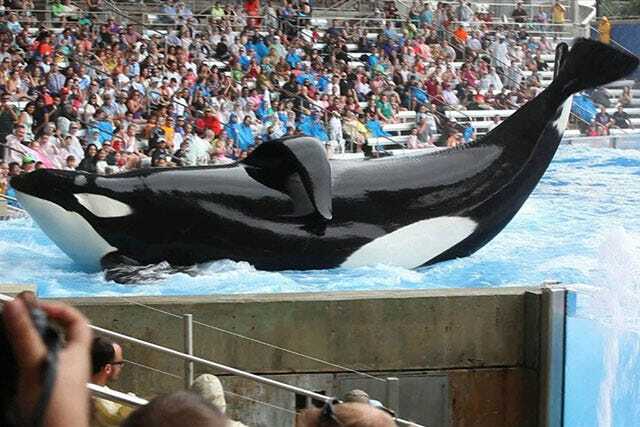 The company has claimed that Blackfish exaggerates information and fails to mention the benefits to conservation and research that animal captivity provides. While there certainly are two sides to every story, it's hard to imagine that any of these beautiful animals wouldn't be better off back in the wild. If you missed the airing last night, mark your calendars for November 12; Blackfish will be available on DVD.